Primary Natural Resources oil, coal, copper, tin, nickel. ONCE ONE OF THE world’s largest empires (under Genghis Khan), Mongolia eventually became a territory of CHINA, then was dominated by the former Soviet Union. 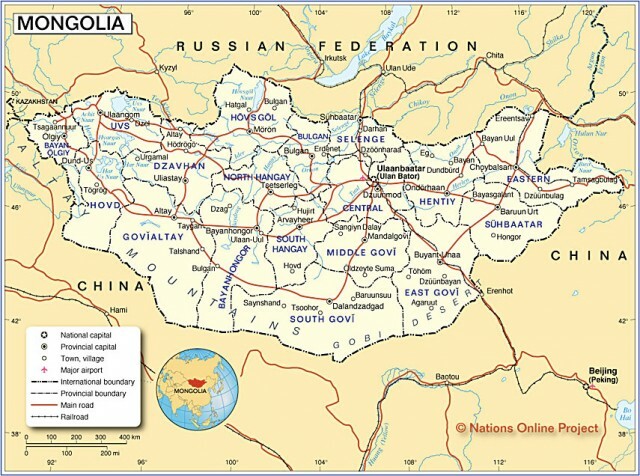 LANDLOCKED (bordered by China and RUSSIA) and often considered to be all DESERT, Mongolia, in fact, contains numerous mountains, forests, and lakes. Only its southern margins bordering on China are drylands and deserts. However, even these support sparse grasses and nomadic herders. Mongolia can be divided into a series of northsouth and east-west grids. Generally, the northern third of the country is mountainous and forest-covered and has several large lakes. Its natural features include the Henti and Hangai mountains and lakes Hovsgol and Ulaangom. The north also is the most economically developed and urbanized segment of the country. The middle section is a STEPPE or GRASSLAND mixed with forests. Desert and grasslands are in the south. Here are concentrated the major herding areas and the nomadic population that emphasizes raising a combination of camels, goats, sheep and horses. It also is the area most susceptible to massive herd losses from winter blizzards known as dzud. Fortunately, animals are a renewable resource. The southernmost section is dominated by sparse grasses and hard desert surfaces. And, as with most deserts, it also is scoured by often tornadic winds and sandstorms. This is the area where the famous dinosaur remains have been concentrated; the first discovery of dinosaur eggs in 1923 was during an expedition led by the scientist Roy Chapman Andrews. Along the axis of an east-west grid, eastern Mongolia is generally a moist and rich grassland. It also has recently been the site of oil and natural gas development. Its closest economic link is with northeast China (the former Manchuria). The western third is dominated by the Altai Mountains and its basins. The population here generally has large numbers of nomadic Kazakhs. There are a number of large inland lakes, such as Ulaangom, that are important wildlife (migratory waterfowl) refuges. The central core area is the most urban. It is dominated by the only rail line in Mongolia. This line links Mongolia with the rest of the world via transit through either China (the shortest route) or Irkutsk in the Russian Federation. Today, Mongolia is a republic with democratic elections and an elected parliament (Hural). An interesting part of Mongolia’s culture is that women have full suffrage, serve in the Hural, and have always had full equality with men, even in the time of Khan.